I made a promise to myself after I had my last suit made in Hong Kong that I would never buy another suit off the peg. It fit so much better, was so perfect, that every suit or jacket since has felt awkward. But it does take a lot of the fun out of browsing. If you don’t buy jackets or suits in shops, or shirts for that matter, and you’ve already bought too many shoes this year, there isn’t much else to look at. Ties, socks and handkerchiefs – that’s about it. As a result I still find myself wandering into Ralph Lauren and browsing the suit rails. I still stroll down the road to Etro and look through their new season’s jackets. I tell myself it’s for inspiration, to pick up ideas for materials, cuts or quirky details that I can ask my tailor to replicate. But in my heart I know I’ll find something that’s too lovely to turn down. It hasn’t happened yet, but it’s only a matter of time. With this predicament in mind I have a recommendation for tailors everywhere – kit out your shops with more examples of potential suits. Display the greatest range of cuts, materials and quirky details. Make coming into your tailoring studio as pleasant and inspiring as the best of the retailers. Make it more like a shop. This would obviously entail a cost – most of those items on display are unlikely to be sold. But every off-the-peg retailer faces similar costs each season when it gets rid of old stock, or sells it at extreme discounts. The costs of occasionally rotating display stock at a tailor would be nowhere near as high. This strategy would have many advantages, but the biggest would be that more people would come and simply spend time in the shop, looking for inspiration or considering a purchase. It is simply an extension of the mannequins that tailors use in their windows, just like any shop, in order to tempt customers in. High-street retailers know the value of browsers – it is a painless way to create brand awareness and desire in potential customers. Tailors generally generate business through reputation or word-of-mouth. But how about if you don’t know that many people who use a tailor? How do you get a recommendation then? And how do you know they’ll be right for you? Wandering into a tailors can be intimidating. They need to break down that fear barrier and encourage people to visit. Much of Savile Row is now better at that than it used to be, encouraging communication and even advertising. But there are still few people who wander in off the street. Give me somewhere I can browse. You won’t be sorry. You can follow the discussion on More browsing in tailors by entering your email address in the box below. You will then receive an email every time a new comment is added. These will also contain a link to a page where you can stop the alerts, and remove all of your related data from the site. I agree completely – part of the reason tayloring is not as widespread as it once was is for this reason. Though in saying that, I feel that my local taylor – Crane Brothers in Auckland city – do a wonderful job of exhibiting inspiration in their studio.. Speaking of taylors in Hong Kong, I’m going there in a couple of months and intend to get a suit or two made up – Do you have any taylors you could recommend to me? Certainly Danny. 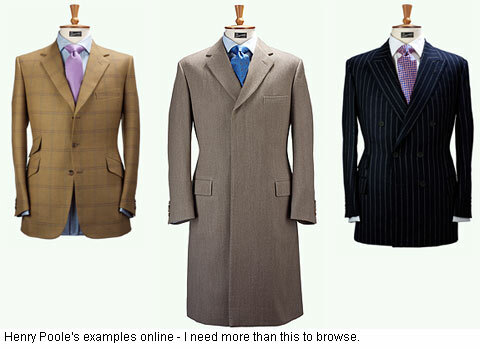 I have written about my tailor in Hong Kong, Edward Tam, in a previous series of posts. Search for the title The Final Suit or go to the link below. Edward’s contact details are in the comments at the bottom. There are, of course, plenty of brands who make off the peg and custom made suits, and who therefore fit the bill of having a large in store display plus the advantage of being able to make suits to measure. Obvious examples are Mark Marengo, Oliver Benjamin and even the bigger names like Paul Smith. Though maybe that’s your point! I really love those clothes.